Large 20" bowl used on 3643 or to update an existing 3613 to a 20" drain bowl. 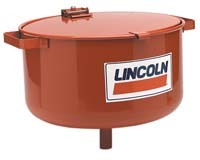 Large 20" bowl used on 3644 or to update an existing 613, 3604, or 3607 to a 20" drain bowl. Standard 14" bowl used on 613, 3604, and 3613 used-oil drains. Same as 91197 but includes lid. Standard 13-1/2" bowl used on 3605 used-oil drains. Large 4-1/2-gallon capacity. 24-1/2" diameter. Use when larger draining area is required. 3610 molded plastic drain pan rests securely on top of used-oil drains. 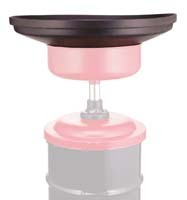 Can be used with pedestal or portable drain devices with 6" or larger drain. Funnel assembly for use with 3614(1). Used fluid drain valve for use with 613 and 3604. 1/2" NPT(m) connection.